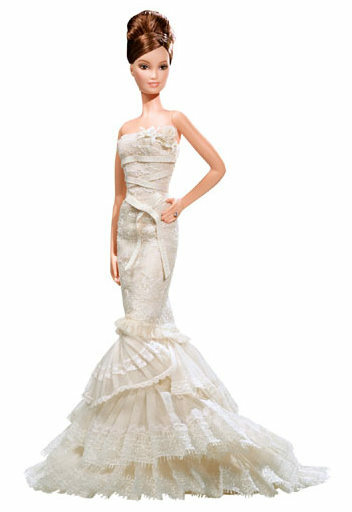 Barbie is 50 years old, but never looks a day older. Barbie is such an iconic, dare I say, doll; that over the years, she has worn everything from jumpsuits to shorts, formal gowns to swimsuits. She has the perfect body proportions for every type of outfit, the perfect heeled feet for those high heels, and she doesn't even have to worry about feet pains or dieting! She is so famous that many designers fight to design clothes for her, and below are some of the most glamourous clothes you'll ever see on a Barbie doll. There are even Barbie dolls of Angelina Jolie, Britney Spears and Rihanna.